1:41. Good Mean to you, too, Wolf. 1:37 Good night one and all! I'm sorry to hear about your diagnosis, Keith. Early detection and treatment is the key. Both my Dad and Uncle were proof of that. I'm sure you'll be in that category, too. We are having a VERY windy day. Hubby has just come back from chasing out recycling containers down the street. He said he now knows why I put our address on them with permanent marker. Ours weren't the only ones blowing around, but, they were the only ones with an address. Lazy day around here... After trying to fight off a cold, recovering from three days of decorating our church for Christmas and not getting to sleep until 4 AM yesternight, (That should be a word!) I was beat! Morning all, my Mum's favourite flower. Kathy, our council puts stickers on our bins with the address printed on it. Lots of very pretty flowers! Just noticed that our neighbours bin was out and ours isn't, better get it out before they turn up to collect it. Morning all. Thanks for all the kind and supportive comments. all. Gorgeous frangipani & their scent is wonderful! Sorry to read your news Keith. Best wishes for your treatment! My understanding is that the results of the treatments are usually successful. Happy 2-day birthday celebration, Serena! Hello all - we never saw any sun today, Shiela - but we had enough wet snow to require shoveling … a good excuse to get some exercise whether we were looking for any or not! Hahaha - went to plan a Thanksgiving left-over dinner but...……… could NOT find any turkey! Apparently in his haste & desire to send home food with all those who came & did much preparation, hubby gave it ALL away! Soo - after snow-removal, turkey legs & thighs purchased to replace the 'missing bird' are now roasting in the oven. It will not come close to that magnificent item served on the holiday, but it will be a complementary item with all the left-over gravy! 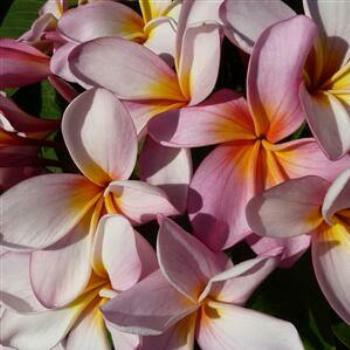 That photo of frangipani is enviable - oh, to live in a tropical paradise where such beauties survive! DoA I tried to watch the cowboy video but it is not available in this country. I wonder how often that happens. Happy Birthday Serena May you have an enjoyable day and bonza year to follow. We are nearly at the end of November and then it is all downhill to Christmas. I'm not quite sure what we will do for comedy with our parliament shutting down for the summer recess and Donald probably hibernating. Beer o'clock, and if I can beat Rage, Peter, Hal et al, I will have a schooner of Iron man. I hope that all of the Sudokuists in Queensland, in fact all Queenslanders are safe from the horrendous fires which are devastating that State. I imagine Saltie can get to safety on his boat, though the fires are in the Rockhampton area. Stay safe. Hey Wombat. What browser do you use? Internet Explorer, Chrome or Firefox? I have a solution for you if you use Firefox. BTW DorA, the cowboy video was good and the travel item reinforces the need to read the fine print. Joyce, King Island is north of Tasmania between Tassie and the mainland. Famous for it's beef and dairy products. beehive, thank you for your suggestion. Unfortunately I use Safari but might be able to access Firefox. I'll let you know how I go, but not today.